Holidays and celebrations are my favorite reasons to make themed food. 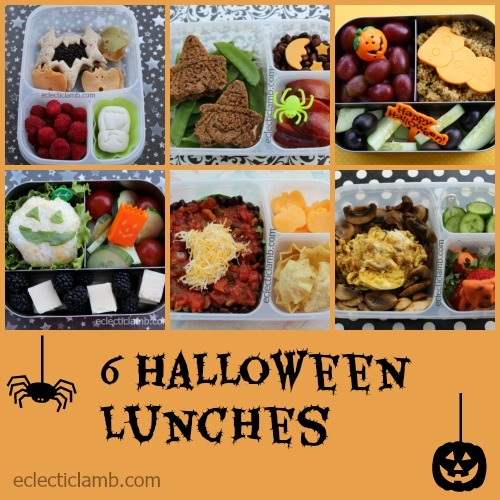 This year I have 6 new lunches for Halloween. 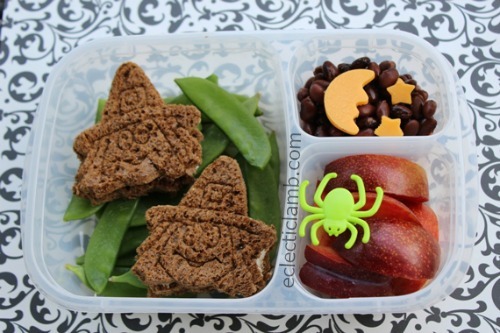 See the end of this post for Halloween lunches I made other years. 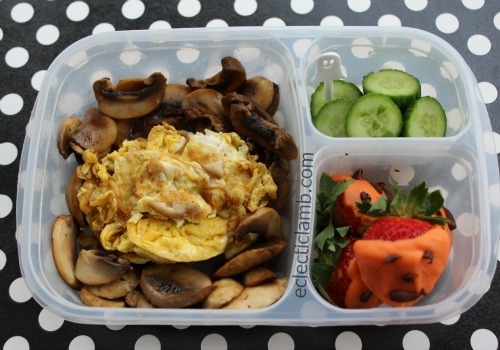 I made this lunch for my husband. 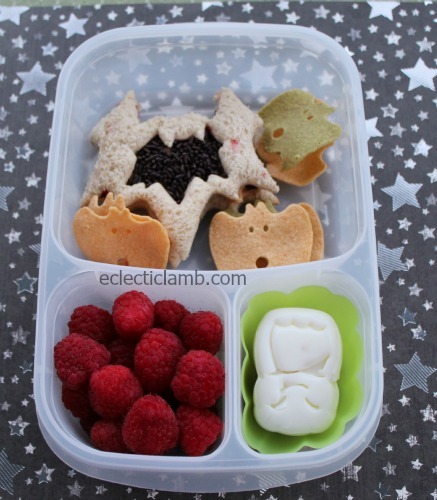 The sandwich was made with a Treat Inside bat cookie cutter set. I used this CuteZCute Animal Palz set to make the bat shaped egg. This lunch was another one I made for myself. 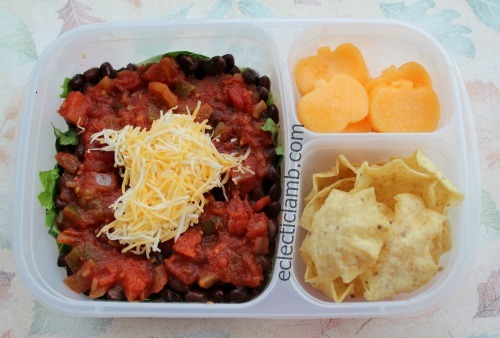 I love the combination of grains and cheese; fresh fruit and vegetables rounded out this healthy meal. I am not sure how obvious this is but this is supposed to be a ghost taco salad. I was worried about my lettuce getting soggy – it was not crisp but it was edible and I would do this again. It was a satisfying lunch. My 13 year old niece designed this for herself and we made it together. If you look closely you can see the mushroom face on the scrambled eggs jack-o-lantern. I tried using pumpkin powder for the first time. 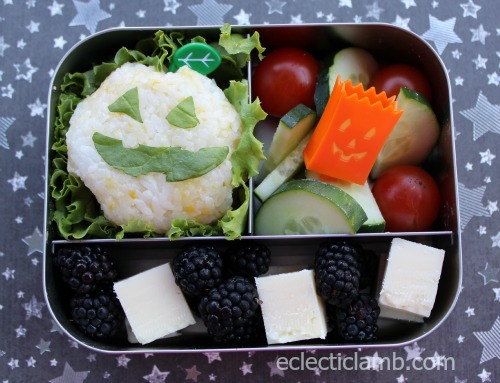 It added a little color to my rice jack-o-lantern but only a mild taste. 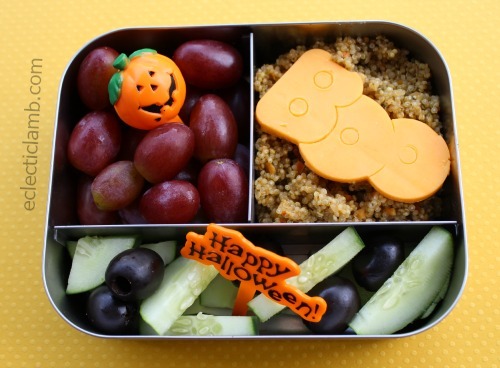 I think this bento would look better with orange Cheddar cheese next to the blackberries but it was a spur of the moment meal with ingredients I had in the house. I made these happy witches with pumpernickel bread I had in the house and a stamp cookie cutter.